Last year, after four years away, Nine Inch Nails returned. For the man that is Nine Inch Nails, Trent Reznor, those years had been kind. He got married, had a child, scored soundtracks and won multiple awards for those soundtracks, including an Oscar for The Social Network. Life had changed. So when he returned with Hesitation Marks last September there was, from some corners, a little bit of disquiet. The guitars were not really there. It wasn't metal, but NiN had long been industrial more than metal. However, it was a great album and a real comeback. So a release so soon afterwards is a surprise. This isn't a follow-up though. It is something else entirely. 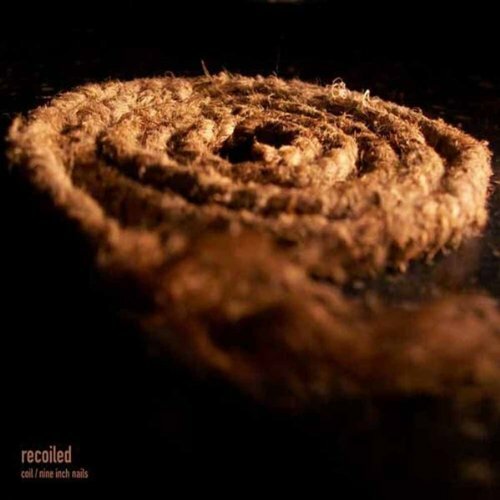 Recoiled goes over old ground by having five remixes of tracks from NiN's past. All bar one of these is from tracks off the career-high Downward Spiral, the other track being from the Broken EP (and, of course, Fixed, the remix of that EP). These remixes are all by Coil and are part of their posthumous releases. They are all lengthy remixes and not for the faint-hearted as they are as dark and brooding as that period was. The tracks can probably be summed up in one word: Menacing. 'Gave Up' leads with a quiet, brooding loop and vocals. Then 90 seconds in it reminds you how good NiN are when they change it up: Drums which sound like a boxer hitting the bag, guitars that sound like a motorcyle, and a repeated mantra on vocals that delivers. The original material and the remix on Broken were good; this is as good. 'Closer' comes next. The Downward Spiral was a dirty, nasty album and 'Closer' was the exemplifier of its virtues. However, we have heard this remix before. In Reznor's first work for David Fincher, this remix was cut about a bit to form the soundtrack to the opening sequence to his seminal film Se7en. This remix is as depraved as that film was. Its vocals are delivered amongst tape-loops, scratches and the kind of treatment that fills you with fear. It's horrifically wonderful. 'The Downward Spiral' remix comes next. It sounds as horribly screwed up as the original, stretched out to a greater length and given more edge, if that were possible. The final two remixes are both of 'Eraser'. The first has been previously available on the download last year, the second is new. The latter, the 'Baby Alarm Remix', is the greater of the two. The original 'Eraser' was already a brooding instrumental-led assault and the 'Baby Alarm Remix' builds on this but downplays the guitars. The other remix, 'Reduction', is far less accomplished and really doesn't add anything. This period of Nine Inch Nails has been picked apart before with the various releases (Fixed, Further Down the Spiral). However, its refreshing to hear Trent Reznor on this form again. The first two tracks in particular remind you of just what an influence NiN have been. Reznor is due to return to soundtrack duties this summer with Gone Girl. However, this is a great reminder of a period in his life when he worked at making you feel uncomfortable. If you love NiN, add an extra '1' to the rating, if not take one away. Either way, revel in the nastiness.